Halo: The Great Journey: The Art of Building Worlds is a hardcover art book that chronicles the artwork behind the Halo universe from 2001 to 2011. It is part of 343 Industries' plans for the ten-year anniversary celebration of the franchise. 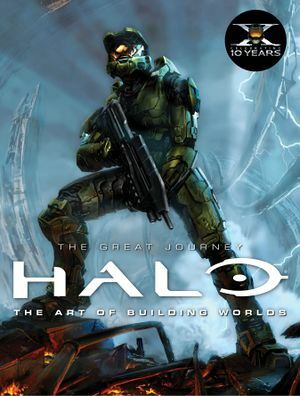 Published by reference/companion and art book specialists Titan Books, Halo: The Great Journey was organized and designed by Martin Robinson, a Halo enthusiast and award-winning journalist for Eurogamer and IGN UK. It features over 400 concept art pieces, sketches and commentaries and was released on October 18, 2011. “ The award-winning Halo series of video games is 10 years old. Having sold more than 40 million copies worldwide, millions of fans have spent billions of hours with the Master Chief and Noble Six, defeating the Covenant and saving the Universe. Now, for the first time in a single art book, Halo: The Great Journey: The Art of Building Worlds brings together a lavish and spectacular collection of groundbreaking art from the entire range of Halo games. This is the ultimate gallery of the Halo universe, with over 400 images including sketches, commentary, and concept art from all stages of development, including characters, weapons, and sweeping landscapes as envisioned by more than thirty of the amazing artists behind the first ten years of Halo including Isaac Hannaford, Shi Kai Wang, Frank Capezzuto and Jaime Jones. The Great Journey begins with a foreword by Frank O'Connor and an introductory overview of the last 10 years of the Halo universe. For a complete overview, read section Official summary above. Limited Edition slipcase and alternate front cover art (bottom view). Limited Edition slipcase and alternate front cover art (side view). Limited Edition slipcase (bottom view). Limited Edition slipcase (spine view). Ashley Wood's Halo 3 artwork used for the Limited Edition's cover. Eddie Smith’s Master Chief from Halo: Combat Evolved (2001). Sparth’s Forerunner architecture from the novel, Halo: Cryptum (2011). Vitaliy Anikin’s corridor battle from Halo: Combat Evolved Anniversary (2011). Vladimir Nenov’s ship interior from Halo: Combat Evolved Anniversary (2011).